Attendees of the 254th ACS National Meeting & Exposition in Washington DC had an opportunity to attend a lecture on the chemistry of drinking water by Dr. David Sedlak, Editor-in-Chief of Environmental Science & Technology and Environmental Science & Technology Letters. The lecture entitled, “Healthy, Tasty, or Toxic: A Chemist’s View of Drinking Water,” provides a tour of the U.S. through five very different glasses of drinking water, exploring the chemistry that determines the quality and availability of drinking water in each city. Dr. Sedalk’s lecture was seen by more than 900 people live and is now available online. The following text is adapted from Dr. Sedlak’s prepared remarks for the lecture. When ACS told me that they were going to find all these people to listen to me talk about drinking water in Washington, DC in late August, I thought that they were joking. I didn’t even think that there were that many people left in the city that late summer. Then I remembered that the city was going to be suffering from an influx of chemists—people who are quite happy to spend their days in windowless rooms suffering in the name of knowledge. So even if you are only here because you wandered in looking for an air conditioned room, I am happy to see you. I also hope that you are thirsty because I want to share some drinking water with you. I’ll drink the water, and you can either drink your water or enjoy them vicariously. After I drink these five glasses of water, I hope you will have a better understanding of how we and solve problems related to our most precious resource. As chemists, we tend to be quite literal when it comes to definitions. To us, water is a compound consisting of one atom of oxygen and two atoms of hydrogen. To the rest of the world, water is a much different thing. The stuff of life. Our most essential resource. Perhaps the most interesting observation is that water is defined by what it is not: no color. No light absorption. No odors. The same thing holds for drinking water: It is suitable for consumption if it comes out of the faucet with no color, odor or substances that absorb visible light. Now a literal chemist might say, this drinking water thing is easy. Just serve people deionized water. But, for reasons that I will show you today, that is just not feasible. In addition to the aesthetic properties, I described, drinking water has to be available in your home 24 hours per day, and it has to cost less than about half a penny per gallon. That half a penny mostly pays for the water pipes and the salaries of the utility employees. The actual cost of water treatment is less than about a twentieth of a penny per gallon. Now, I want to take share five glasses of drinking water with you. Each one is filled with colorless and odorless H2O. Sometimes we drink them because we are thirsty. We drink them because they maintain our health. We drink them because they taste good. And when we drink them we do not need to worry that they contain toxins or microbes that will make you sick. But they did not start out that way. All water has impurities. Those impurities are like footprints in the sand, telling us where the water has been and what it has done. Removing enough of the impurities to make the water healthy, tasty and non-toxic is the challenge of drinking water treatment. Let’s see if we can understand this challenge by translating it into the language of chemistry. One of the first lessons of water chemistry is that we mix and match references states in the expression of equilibrium constants. Consider the dissociation of water—one of the simplest reactions in chemistry. For a water chemist, this reaction is second nature. As a result, we often forget that equilibrium constants are expressed according to different standard states. For water, we use molarity (moles per liter) when we describe solutes. The activity of each solute is simply the product of the activity coefficient and its concentration in moles per liter. Under the conditions, we find in drinking water the activity coefficients are close to one and thus are sometimes ignored. For water, we use the mole fraction scale instead of the molarity scale and a different symbol for the activity coefficient. Under the conditions found in drinking water, both the activity coefficient and the concentration are approximately equal to one. This is quite a robust assumption. I calculated the mole fraction of water in our five glasses of drinking water are all > 0.9998. Even though the concentration of impurities in those glasses is negligible, I can assure you that it is the other stuff, the summation n, that makes all the difference. Let’s have a closer look at those impurities. The most prominent of these impurities is salt. All water contains dissolved ions arising from the dissolution of minerals. If you evaporate seawater in the sun using the traditional method of making table salt, every liter will produce about 35 grams of sea salt (or 3.5%). These dissolved salts largely determine the taste of water. Of course, everyone knows that you cannot drink seawater. Add as little as a half a gram of salt to water, and it is unpalatable. If you have drunk tap water ever in a city in the American Southwest and thought that it tasted a bit funny, it was probably because of salts. As the water made its way from its source to the water treatment plant under the hot desert sun, the concentration of dissolved salts increased due to evaporation. On the other end of the spectrum is distilled water. Water without salts also doesn’t taste very good either. To assure that consumers have the same experience with their product anywhere in the world, some companies that sell bottled water first take out all of the salts and then add in a mix of salts that they have determined are tastiest to their customers. Other companies simply bottle water from natural springs in beautiful places. Drinking water in most cities falls within this range of salt concentrations that we find to be tasty. Your sensitivity and preferences are determined mostly by what you get used to. This figure depicts the range of concentrations of four of the most common anions and cations that we encounter in water on a logarithmic scale, both in mole fraction and moles per liter. Sodium and chloride, the two most prominent ions in seawater also occur at the highest concentrations in freshwater. The divalent ions, calcium, and sulfate occur at lower concentrations and exhibit more variation determined by upon the local geology. With this background in mind, the first glass of water that I would like to share with you comes from Tampa, Florida. Despite being located in a place where it rains more than a meter per year, the local rivers and groundwater aquifers do not provide a supply adequate for the 3 million people who live in the Tampa Bay metro area. To assure that there would be enough water, the city spent over $150 million to build a 100 million liter per day desalination plant in 2008. But this was only one chapter in a story that had started almost two thousand years earlier. In ancient times, sailors realized that you could separate salts from seawater by boiling it and capturing the steam on a sponge. This was not a very practical solution for cities, but over time engineers working with the tools of the industrial revolution came up with more sophisticated ways of using distillation as a means of extracting fresh water from the ocean. By taking advantage of pressure, heat recovery and other properties of water they were able to make the process efficient enough for people with little or no water resources and a lot of fuel to burn (like the sugar plantations of the Caribbean or the oil-producing nations of the middle east to use it as a means of producing drinking water. But that wasn’t going to cut it for the rest of the world. Back in 1961, JFK prioritized investment in an obscure US government agency called the office of saline waters. $150 million per year at its peak (in today’s dollars) jump-started a series of revolutionary ideas for separating fresh water from salts. Over the past fifty years, those the basic research seeded by the US government and others has gradually moved from the lab bench to pilot plants to the creation of a mature water desalination industry. One of the key inventions originating from that period is the reverse osmosis membrane. The Principle of RO is relatively straightforward. As you might know, osmosis is the process through which water diffuses across a membrane from a region of low concentration to one of high concentration to even out the osmotic pressure. Reverse osmosis involves the application of pressure to the high salt concentration solution to overcome the osmotic pressure and drive water molecules through a membrane. With funding from the Office of Saline Waters, researchers working at UCLA developed a thin polymeric membrane that made reverse osmosis desalination of seawater possible. As you might imagine, pressurizing large volumes of seawater to 50-70 bar is an energy intensive process, and in the early years, the seawater RO plants required about as much energy as plants that used the distillation process. But as the membranes moved out of the laboratory, engineers invented better materials and clever ways of recovering the energy that they invested to overcome the osmotic pressure. Over the last 40 years, the energy required to desalinate seawater by reverse osmosis has decreased by over a factor of five. Regarding energy consumption, modern, reverse osmosis desalination plants are approaching the minimum theoretical energy needed to separate salts from water. As a result, attention is now turning toward ways of improving the performance of membranes by increasing water flux and decreasing the need to take them out of service for cleaning. As part of these investigations, chemists have learned that the workhorse polyamide membrane is more complicated than initially thought. It turns out that as the polymer forms, the crosslinking agents create layers of benzene rings that give rise to zones where water can diffuse more quickly across the membrane, These special, high water diffusion regions, shown in red, are where the bulk of the action happens regarding diffusion through the membrane. By using molecular simulations, like those shown here, we may be able to understand ways to increase the number of water diffusion fast lanes and thereby decrease the area of membranes needed to desalinate water. If we could do this, membrane modules would become less expensive, and the overall cost of desalination would shrink. The second glass of drinking water that I would like to share with you comes from El Paso, Texas. When it was still a small, border town, El Paso might have been able to rely on local sources of water, like the Rio Grande River, local reservoirs, and aquifers. But as the Metro area has grown to close to a million people it had to look for new supplies. El Paso obtains about 5% of its water from a groundwater aquifer that up until 20 years ago was considered to be undrinkable because of the high levels of salts that it contained. But thanks to advances in the performance of reverse osmosis membranes (the cartridges are shown here), the city was able to build a $90 million desalination plant to in 2007. According to the US Geological Survey, El Paso and some other cities sit on top of vast, untapped reserves of brackish groundwater. At 1 to 10 g/L of dissolved salts, brackish groundwater is too salty to drink. But it is still easier to desalinate than seawater. Brackish waters arise from the fact that groundwater gets trapped in contact with minerals and as the minerals dissolve over hundreds of years, the salts build up. We can mine these ancient water sources the same way we mine petroleum deposits. This map gives us an idea of some of the major known pools of brackish groundwater. Texas, Florida, and Arizona—three of our most water-stressed states have reserves of water that is mainly NaCl, likely from the dissolution of marine sediments that were rich in halites (sea salt). El Paso is not alone in its quest to mine brackish groundwater: San Antonio is building a desalination plant that will be even bigger than El Paso’. The center of the country is underlain by a band of water where calcium and sulfate are the main dissolved salts, mainly from the dissolution of CaSO4 (gypsum), BaSO4 (barite) and CaCO3 (calcite). Finally, CA’s central valley has reserves that are a mixture of these two types of salts. Although a variety of technologies invented during the heyday of the Office of Saline Water can be used to desalinate brackish groundwater reverse osmosis is still the most common approach. As water molecules and a few salt ions that manage to get through imperfections in the membrane pass through the membrane the salt concentration on the other side increases. This stuff that remains, which we refer to as reverse osmosis concentrate, is a limiting factor in the desalination process. Operators of treatment plants want to recover as much freshwater as possible, both to increase the amount of drinking water that they produce to minimize the volume of reverse osmosis concentrate that they create. Cities that cannot simply pipe the reverse osmosis concentrate into the sea find that evaporating off the remaining water or finding places where it will not cause environmental problems can be the most expensive part of the whole treatment process. In addition to the need to apply higher pressures to overcome osmotic pressure as the salt levels increase in the concentrate, the problem with water recovery comes down to the formation of inorganic minerals on the surface of the membrane. Consider what happens as the levels of calcium and sulfate increase as water passes through the reverse osmosis membrane. Even for waters where the main dissolved ions are Na and Cl, eventually, the solution will become supersaturated with gypsum (CaSO4). When this happens, the precipitate forms produces a layer of crystals on the surface oof the membrane that prevents the passage of water as shown in this electron microscope image. To address this problem, chemists have come up with a variety of strategies. The most common approach is to add chemicals known as antiscalants to the drinking water. These chemicals disrupt the formation of the mineral crystals on the membrane surface by adding charge to the nucleating crystals which can cause them to disperse into solution. The development of better antiscalants is a critical need, not just for treatment of brackish water, but for applications in energy production and industry where mineral precipitation causes problems. It shouldn’t surprise us that when it comes to salts and mineral precipitation in water treatment, we are concerned about compounds containing calcium, silicon, iron, carbon, and oxygen. After all, they are among the most common elements in the earth’s crust as shown in this figure. What might be a little bit more surprising is all of the trouble caused by some of the less common elements scattered around the periodic table. In this case, the problems are mainly related to their toxicity. After all, biological systems did not need to evolve defenses against exposure to substances that they rarely encounter. Unfortunately, our quest for new sources of drinking water, as well as our desire to exploit the unique properties of some of these elements means that they sometimes occur in our drinking water at concentrations that cause health problems. Among these less common elements, three tend to cause the majority of the problems with drinking water: arsenic, chromium, and lead. As you can see, the concentrations of these three elements in drinking water are typically a thousand times lower than those of the salts that we worry about during desalination. Nonetheless, arsenic and chromium have some things in common with the ions found in brackish groundwater: they often arise from the dissolution of minerals that remain in contact with water for long periods. It’s just that the arsenic and chromium-containing minerals are a lot less soluble than gypsum and halite. For such geogenic contaminants, our ability to pump water from deep aquifers often brings us into contact with these elements. All three of these elements are also used for industrial purposes, which has caused contamination of drinking water supplies. I think that no discussion of drinking water in the US in 2017 would be complete without a discussion of lead. Lead has a melting point of 327.5 C. As a result, it was relatively easy for the Romans to make lead pipes (this one here is from an ancient Roman Bath, England. So for the Romans and plumbers up through the centuries, the lead was intertwined with drinking water. Even after we figured out how to make pipes out of copper, cast iron, steel, and cement, we still used lead to join pipes together (as solder) and in other applications where we needed a malleable material. The first question you may be asking yourself is, “Have people been getting poisoned by lead in their drinking water for these last 2500 years?” After all, the moment you expose a lead pipe to oxygen and water the surface gets oxidized, which would allow the divalent lead to leach out. The answer to that question depends upon chemistry. Fortunately for the Romans, they lived in an area where there were a lot of carbonate-containing minerals. This meant that as the drinking water flowed through the lead pipes, there was often enough calcium and carbonate to assure that a layer of calcite (CaCO3) precipitated on the surface, preventing the lead from coming into contact with the water. But even if parts of the Roman piping that were not coated with calcite, a layer of lead carbonate mineral form on the surface and coat it. Places in which the drinking water did not contain high levels of carbonate were not as lucky. For example, in parts of New England, where the drinking water doesn’t contain a lot of carbonates a significant fraction of the population had chronic lead poisoning: Using forensic tools and medical records, it has been estimated that 10% of the population of Massachusetts in the 1920s was showing symptoms of lead poisoning. Luckily for people in those communities, US cities started to add chlorine (hypochlorous acid/hypochlorite) to their drinking water in the first few decades of the 20th century. This caused the divalent lead corrosion layer to undergo oxidation to a tetravalent lead oxide, which is incredibly insoluble. For decades we have limped along with various remedies, like pH adjustment to encourage carbonate mineral formation. In the early 1990s, the US government passed a rule requiring that cities with lead pipes add a small amount of phosphate to create various lead phosphate minerals. This approach is used every day in hundreds of cities around the US. It allows them to continue to deliver water in their antiquated pipe networks, but as you are probably starting to see, it is not a simple process. And Flint, Michigan, has shown us that our current policy of serving millions of people water through a distribution network that contains lead pipes is a recipe for disaster. So I would not share a glass of Flint tap water with you. Instead, I want to share a glass of drinking water from Madison, Wisconsin. Like Flint, the old part of downtown Madison had sections of the city that had old lead pipes that were leaching. But when they tried to add phosphate to decrease lead levels it didn’t work very well. First, for reasons related to the local water chemistry, the phosphate didn’t lower the dissolved lead concentrations the way they were supposed to. Also, there was another problem related to phosphate addition. As anyone who has ever been to Madison knows, the twin lakes that surround the city are a source of civic pride, beauty, and recreational opportunities. The city has been battling against algae blooms that turn the lakes green and render them unusable. The algae growth is caused by phosphorus that is released by upstream farms and local water users. So adding phosphate to the drinking water supply seemed like a bad idea because some of it would find its way into the lake or to the next sets of lakes downstream, where the city discharges its wastewater. So rather than fooling around with the management of lead, the city ripped the lead pipes out and replaced them. Luckily for Madison, the problem was limited to a small section of the old city. As a result, it only cost about $15 million to do it or about $60 per person. According to the AWWA, the cost of repeating what Madison did in all of the cities in the United States with lead pipes would be over $30 billion, or about $90 per person if we shared it over the entire country. Madison solved their lead problem by investing in their infrastructure to solve the problem all at once rather than limping along with half measures. It remains to be seen if the rest of the country can follow their lead. This problem of drinking water infrastructure investments to protect public health and the environment is the background behind our last two glasses of water. In these examples, the solutes that we are concerned about are organic chemicals that typically occur at concentrations that are typically ten to a hundred times lower than those of arsenic, chromium, and lead. To water chemists, they are known by their abbreviations, THMs (trihalomethanes), HAAs (haloacetic acids) and NDMA (nitrosodimethylamine). All of them are created when we disinfect water to remove harmful microbes, so it makes sense to start understanding them by considering the water disinfection process. 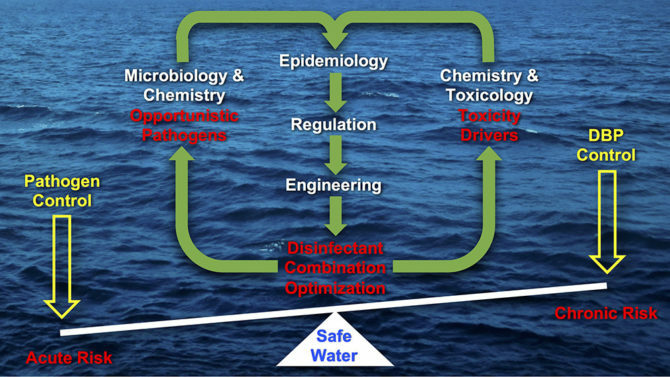 The main reason that we treat drinking water is to protect us from waterborne pathogens. During the 19th century cholera (caused by a virus) and typhoid fever (caused by the bacterium) were commonplace in US drinking water. With the advent of water filtration and chlorine disinfection in the turn of the century, the lives of people in North America increased by about seven years as shown in this figure of typhoid fever mortality in Baltimore in the early 20th century. In the early days, the science of disinfection was quite empirical: If you add more chlorine to the water, the pathogens go away faster. But as the practice became more common this wasn’t good enough because every water that was being treated behaved differently because of solutes in the water, like dissolved ferrous iron and organic matter, caused the chlorine to decay away at different rates. Thankfully, a microbiologist named Harriet Chick used a quantitative chemistry approach to describe the relationship between chlorine exposure and microbe inactivation. If you can conceive of the disinfection process as a chemical reaction, like an electrophilic substitution of HOCl on a thiol group on a key membrane protein, it is the dose or the product of chlorine concentration and time that determines the inactivation for any specific organism. Chick and her collaborators showed that each organism had a unique sensitivity (the Chick-Watson coefficient, lambda. Therefore, the operator of water treatment plants just needed to quantify the kinetics of chlorine disappearance in their specific system and adjust the initial concentration until they had achieved an adequate dose for disinfection. Let’s assume that the chlorine (hypochlorite at the pH of many water treatment plants undergoes a first order decay. After one hour a chlorine contact tank at the water treatment plant it is almost all gone, so there will be a little bit left when it goes into the underground pipe network, and the drinking water will not taste like a swimming pool. One of the main reasons that the chlorine is disappearing in the treatment plant is that it is reacting with dissolved organic compounds. If the water came from a lake or river, those organic compounds would include polymeric materials produced when algae, leaves, and bacteria died and started to decay. This so called dissolved organic matter is a complex mixture of stuff that chemists have been studying for decades. Despite decades of study, chemists don’t entirely understand the structure of this natural organic matter. We know that it varies in composition from place to place and we also know that it contains an electron-rich functional group. Like phenols and amines that react with chlorine, causing it to disappear in the drinking water treatment plant. When these reactions occur, a small fraction (i.e., a few percent) are converted into small, chlorine-containing compounds. In particular, the trihalomethanes, like chloroform (CHCl3) and haloacetic acid s. The presence of these compounds, which we refer to as chlorine disinfection byproducts, has been correlated with increased risks of developing bladder cancer, miscarriages, and other health problems. So the flip side chlorine disinfection is that the higher the dose of chlorine, the higher the concentration of chlorine disinfection byproducts will be formed. Normally, for a drinking water treatment plant, the designers employ their knowledge to balance the dose against the formation of disinfection byproducts. They must choose an initial chlorine concentration that is high enough to inactivate the pathogens, but not so much that they form disinfection byproducts at concentrations that endanger the health of community members. Our fourth glass of drinking water comes from the town of Celina, Ohio, a small city on the western side of the state where it wasn’t possible to find a suitable solution to the disinfection/disinfection byproduct balancing act. Like Madison, Celina is located on the shores of a beautiful lake. And like Madison, the town struggles with algae blooms. But unlike Madison, the lake is the source of the city’s drinking water and all of that algae releases dissolved organic matter that produces disinfection byproducts when they are exposed to chlorine. Celina couldn’t find a way to use chlorine to adequately disinfect their drinking water without forming unacceptable levels of disinfection byproducts. Celina’s solution has been to pass all of their drinking water through activated carbon. Activated carbon is essentially charcoal that is treated with acid before it is pyrolyzed. This causes it to develop a high surface area through the formation of pores. The hydrophobic and hydrophilic regions of this high surface area material create strong intermolecular reactions between the surface and that polymeric organic matter, causing it to adsorb to the material. Activated carbon also removes the musty flavored compounds that are often produced by algae. You might be familiar with activated carbon if you use one of those filters in a pitcher for your drinking water. Doing this at the scale of an entire city is a different matter and requires tons of the stuff each year. The cost is less than 0.05 cents per gallon. It has made the city’s drinking water more expensive, but if they cannot control the nutrients that come into the lake from nearby farms, it would be unpalatable and unhealthy. The last glass of drinking water that I would like to share with you comes from Anaheim, California. Anaheim is part of an area of southern California that sits in Orange County. Because it is not officially a part of LA or San Diego, it does not have the same access to imported water as its neighbors to the North and the South. Luckily the city does have access to groundwater, which supplies the majority of the drinking water to the city. So starting in the early 1970s, the local water district began pioneering a new approach referred to as groundwater replenishment or potable water reuse. The way it works as follows: Water that people flush down the toilet goes to the wastewater treatment plant. After that, it is passed through reverse osmosis membranes (similar to the ones used for seawater desalination). The wastewater is used because it takes a lot less energy than seawater because it is only about 2% of the salinity of seawater. From the early days of the 1970s, the water was put back into the aquifer after RO. But in the early 1990s, the city discovered a new contaminant that passed through the RO membrane—NDMA. But in the early 1990s, scientists working for the state of California discovered low levels of NDMA in the water produced by the advanced treatment plant. This was a major concern because toxicologists had determined the safe level of this potent carcinogen in drinking water to be several parts per trillion. As part of his Ph.D. dissertation, my student Bill Mitch discovered that the culprit was chlorine. You see, chlorine was added to the water before it went through the microfilters, which serve as the pre-treatment step to prepare it for reverse osmosis. The chlorine was added not to kill pathogens, but to minimize the growth of bacteria on the microfilters. When chlorine is added to wastewater that contains ammonia, chloramines form. Those chloramines undergo an acid-catalyzed disproportionation reaction to produce dichloramines. The dichloramines then react with compounds like dimethylamine in the wastewater to produce a hydrazine compound that is then oxidized by oxygen to produce NDMA. The NDMA is so small and polar that it can slip through the RO membrane along with the water molecules. To solve this problem, the city installed a UV lamp and added about a millimole per liter of hydrogen peroxide after the reverse osmosis step. The hydroxyl radicals generated in this step rapidly oxidized the NDMA and any other compounds that snuck through the membrane. So the new version of the advanced water treatment plant has the extra step of UV/H2O2 as an extra failsafe. This new approach to recycling water is catching on throughout the US southwest and is now providing the drinking water for several million people in California, Texas, and Arizona. So there you have it: a glimpse into the world of drinking water in five glasses. As we have seen, the challenge of drinking water is providing thirsty cities with drinking water that is healthy, tasty and non-toxic. This challenge is complicated by the need to treat waters that start out with vastly different compositions. The challenge is also complicated by society’s assumption that the creation of drinking water is simple. I hope that this glimpse into some of the challenges associated with drinking water has shown you that the challenge of drinking water is one where chemists can and will continue to play a major role.